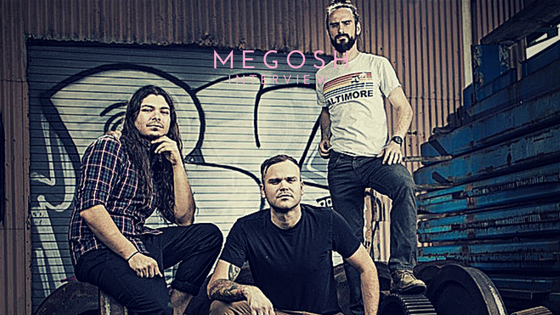 2016 was the year for Maryland-based band Megosh. Their latest record, Apostasy, was released with Outerloop Records and received great reviews. One of those reviews was in Alternative Press Magazine, something they dreamed of. Josh Grosscup and Finch Flores, original members of the band, met in elementary school but never performed together – except for that one time at Discovery Zone when they were 12. There was a point in their separate music careers that Grosscup was looking for the next step. After working with half-dedicated musicians and getting virtually nowhere, Grosscup took to Myspace to find his old friend. Grosscup hadn’t seen Flores in about a year or so and couldn’t find him anywhere on the social media platform. Just as he was about to sign out of his profile, he checked his messages. “What are you doing?” – A message from Finch Flores. Flores posted a Craigslist ad and along came Derv Polimene. He may have lied about his age (and hasn’t been able to live it down to this day) but his audition blew the guys away. A band with three-part harmonies was essentially not heard of at the time, and these guys were ready to change that. The entire record was self-produced and an all-around smooth process. The progressive rock with pop sensibility sound that’s heard throughout the record is 100% genuine, and more importantly, something that Grosscup, Flores and Polimene are 100% proud of. The brotherhood and professional relationship of Megosh is beyond what can be put into words. “We’re definitely a family; it’s a dysfunctional one for sure,” Flores said. Their hometown has that sort of underdog tone to it, and that tone has continued with Megosh. With the success of Apostasy, it’s finally starting to feel like everything is falling into place.